I have to admit that the title does seem like a kitchen disaster or a gourmet who has galloped for the last time; I can assure you there is not cooking in this demonstration and your NVQ in food hygiene is not required. We are simply looking at Easter Eggs in the software management suite in Debian. This, of course, makes up part the Raspberry Pi arsenal of available Operating systems. A cow, in the delicate pixels that could only be ascii art. 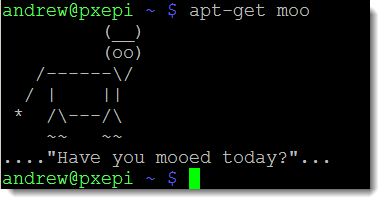 Then aptitude -v moo and so on, here we see with -vvvv. Don’t spoil the fun though build up one by one. Open source developers do know how to have fun and not all Easter Eggs take mega-bytes of code and resource.